How to measure your ring size? This product is with gifts from which you will be able to select on checkout page. 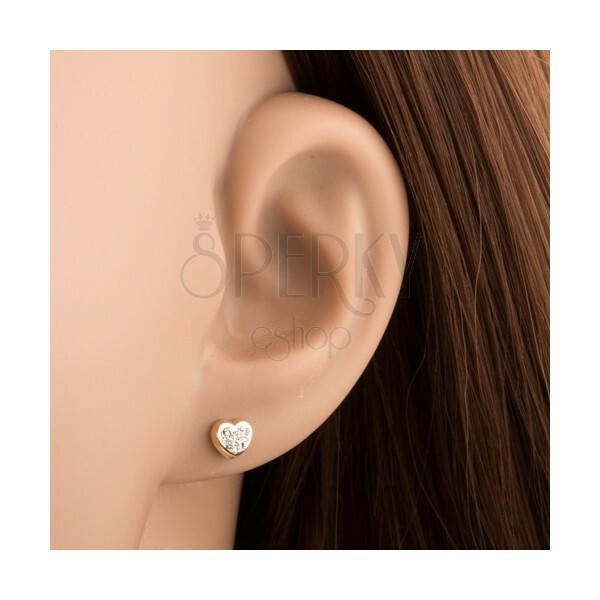 375 gold earrings - glossy symmetric heart, Swarovski crystal of transparent finish, stud fastening. By buying this product you can collect up to 31 points as a voucher of 6,20 €. Your reward points. Yellow 9K gold earrings have a shape of small symmetric heart. Heart is smooth, glossy and it has slightly convexed surface. The heart is dotted with tiny cut Swarovski crystals in the front part. The crystals are of clear colour. Earrings have removable closure retained by friction. Price is for a pair. Goods are well-arranged. I am satisfied because the web site is very well-arranged and the delivery period is really very positive. Thank you. Speed. I do recommend this e-shop, very quick delivery of ordered goods, no problems. I am very content and in the future, I will certainly give preference to this shop. Fast delivery (ordered on Thursday, delivered on Monday), high-quality goods, reliable, quick delivery of products in stock, strong and high-quality goods.